Captain Ed McCoy grew up in Northern Michigan fly fishing for trout, salmon, and steelhead. Ed graduated from Michigan State University with degrees in Zoology and Fisheries & Wildlife. While attending MSU he worked on several research projects studying stream ecology and fish biology in Northern Michigan. After graduating from MSU he then enrolled in a post-graduate research position at the University of Michigan. He was very fortunate throughout his college years to be able to study (and play) on some of our most notable rivers such as the Au Sable, Manistee, Muskegon, Pere Marquette, and Pine Rivers. Ed enjoys sharing this knowledge with our clients, and “putting it to work”. 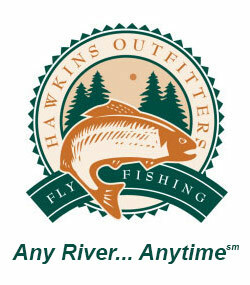 As a full time guide with over 12 years of experience (10 with Hawkins Outfitters), Ed enjoys every aspect of fly fishing and if it has fins he will chase it. Ed is a very talented dry fly fisherman with several of his go to patterns available through the Orvis catalogue, including the Real McCoy AP Spinner , Real McCoy AP Drake Parachute , and the Real McCoy Foam Belly Hex. Ed has also been featured in several publications and most recently as the featured tier in ‘This is Fly Magazine, Issue 48’.